According to what I saw on August 9th 2010, it looks as the only free and fair elections in Rwanda are those which have not yet been conducted or imagined. The recent election in my country, Rwanda of which I experienced personally, left all and sundry astounded. This election left every one asking a single question related to the role of elections monitors/observers. When they came here in Rwanda, they were chauffeur-driven to expensive hotels, their role was to eat and drink eye closed, and then off to the airport chauffeur-driven to their capitals. That was the end of their businesses. In real terms it was electoral fallacy. I always wonder if these observers are given basic training in matters pertaining to their crucial missions and moral responsibilities. One of them was Dr. Salim Ahmed Salim, former Secretary General of the Organization of African Unity (OAU), who headed the Commonwealth Observer Group (COG), a body that was constituted by the Commonwealth Secretary-General at the invitation of our unrepentant National Electoral Commission (NEC). The COG had a mandate to observe the preparation for the elections, the polling, the counting and the overall electoral environment. If I remember well this man he might be the one who left nought on OAU score card. The next was former President of Burundi H.E. Sylvestre Ntibantunganya. After witnessing the Burundi electoral saga on 28 June 2010, he came to observe elections here in Rwanda!!!! Any way, from a political angle, we are going where Burundians are coming from. When elections ended, to my uttermost surprise, however, when asked (Dr. Salim Ahmed Salim) by a New Times (Government supported Newspaper) journalist about his own assessment of the process, he replied “We are extremely impressed by the determination of Rwandans to exercise their democratic rights”. This was patently an insult to the people of Rwanda. But here are intriguing and thoughts provoking questions: why resources are spent where elections’ outcomes are already known? Why do we like these symbolic electoral gymnastics? Imagine millions and billions of dollars, and pounds spent on this electoral charade. Why can’t we use these resources and strengthen the most RPF infiltrated institutions such as our ever weak and political enduring civil society, parliament, the judicial system, etc? It is when this electoral comedy ended that I tried to collect different testimonies from different voters. Collecting these testimonies was a trouble-free exercise as my relatives head some villages. As it appeared, there is no difference to what happened during the 2003 presidential elections. When National Electoral Commission Facilitators were told that the former Premier Minister Faustin Twagiramungu was going to defeat General Paul Kagame a decision was taken to bring extra-ballot papers. Those who were there remember well how it took almost six months for ink to get off their fingers. Imagine submerging your finger in ink and fingerprint at least one thousand ballot papers. This was done despite the fact that in many villages, village heads had already taken all voting cards on eve of the elections day and the next day (of voting) what they did was to collect their cards marked “YATOYE” meaning “HE HAS VOTED”. This emphatically corroborated with what FDU-INKINGI committee made public soon after this treacherous exercise of August 9th 2010, stressing that “in many areas of the north and west of Rwanda such as Busasamana, Cyanzarwe, Bugeshi Kanzenze and Nyabihu, the population had their voting cards seized by local authority. They were ordered to show up and collect their cards at poll stations as early as 4 o’clock in the morning. At the polling station, their voting cards were returned to them with “VOTED” stamp mark already on”. This vividly is also supported by the League for Human Rights in the Great Lakes Region (LDGL) report which criticized the electoral process alleging that “in some parts of the country where their observers monitored, people did not exercise their rights to vote but rather others (local leaders) voted for them”. On all these allegations, the government has decided to remain silent. In fact most parts of the country people were told to come as early as 4:00 AM. But this was not an act of generosity, rather to collect their already stamped voting cards. All in all elections started, and ended when observers were almost still asleep in their lavishly hotels. This was done under what is known as “performance contract”. Leaders whatever they do, under any circumstances, and through any mechanisms, proper or dubious they must achieve the ruling party’s goals. Thus as an assessment was to be done latter after elections, the top performer has to be trusted and the poor performers to be investigated. Fear scratching their brains, village heads collected all voting cards from their subjects and on elections day, instead of casting their votes, they went (people) to collect their stamped voting cards. In addition to that, in most rural areas there was no secrecy in voting. People were shown were to put their fingers, and nowhere else but on President Kagame’s picture. This daylight robbery and unchristian act was done all over the country but excessively in the Northern and the Western parts of the country. This human rights violation succeeded because all villages were equipped with at least a single polling station. Equipping each and every village with a polling station was a barbaric strategy crafted by the RPF through its arm-NEC- to ensure that villages where RPF is lowly supported are caught red-handed. But to observers, they wrongfully thought this was a good strategy which allows people to cast their votes on their door steps. Additionally, soft contenders willingly chosen by the ruling party, did not want to be represented at all polling stations, except those seen as being closer to the so-called ‘Foreign Observers’ led by Dr. Salim Ahmed Salim and the former President of Burundi H.E. Ntibantunganya. All these dirty tricks were used in most cases by village heads because voting against the ruling party is tantamount to political assassination. Hence village heads had to prevail and avoid such political calamity. I observed that soon after casting their votes most people did not even wait the counting exercise. In fact, when a voter believes his or her voice counts; that his/her voice can drive the country in a different direction, in most cases she/he waits until the verdict is pronounced. I saw this during the constitutional referendum in Kenya when people were asked to choose Yes or No. Most people passed their unforgettable night on polling stations. Their intention was to guard jealously their decisions (their Votes). But we (Rwandese) knew our voices meant less, hence leaving a polling station was as good as leaving a graveyard after a burial ceremony. This was a major preoccupation of local journalists on different radio stations across the country during "live" vote counting exercise. All in all, this is due to the fact that the whole process was seen as a political gimmick that amounts to nothing but renewed dictatorship. This also shows how people were not interested by this electoral charade. Despite persistent calls by the commission, requesting people to go and check their names on voters roll, many people did not heed NEC’s call. This is because people know that the current regime does not value the most cherished; the most fundamental; and God-given right of choosing our Leaders. In addition, people do not believe in our NEC. A great number of people did not vote. This is because they were no where on the list. To my surprise when people were asked to comment on what may follow after missing the exercise (Journalists suggesting to even wait the next decade (2017)) most of them shed tears. They expressed fear saying they might be victimized if their voting cards were not stamped. They said if they were to be arrested they could find themselves in a compromising position as they do not have anything to show local authorities? From these testimonies it is beyond reasonable doubt that people voted against their will because there was no choice. Thus one votes because he/she wants her/his voting card to be stamped. And this was also done for the sake of satisfying the current force-backed regime. 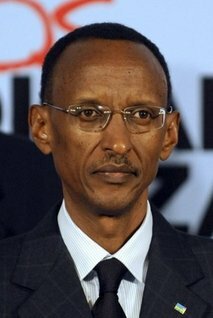 If you don’t know how this government operates, please use Google and read the article "The Paul Kagame I know" by Robert Krueger. Today the most heated debate among Rwandan intellectuals and ordinary people revolve around congratulatory messages. Leaders have refrained from sending these messages to the re-elected President. We strongly believe it is due to galvanized efforts by civic organizations, and other activists and peace lovers who continue to show the international community the unfolding politics of our leaders. Politics of politicking is unfolding here. Different leaders have been very cautious, vigilant, and careful due to political mayhem we went through as a country until elections date and thereafter. The first message came from his so-called challengers, those whose motivation and intention was to legitimize the process and be rewarded government posts. Hon. Ntawukuriryayo Jean-Damascene who represented PSD is touted to become the Rwanda Premier Minister in the next government. As I told you long ago, this formula is a calculated move, deliberately crafted by these political vultures so as to entrench political power within their circle. The name of the President of the Liberal party (PL), now the President of the Senate, Dr. Biruta Vincent, circulated in the corridors of power for a while, but was latter discarded because of his weaknesses as well as low political profile. The unexpected and bitter messages came from The Bush House and the Canadian Government. Both messages were not in fact ordinary messages, but a clear warning to Kigali that a new political dispensation is indeed needed. Other highly expected message came from the remaining worst authoritarian leader and his closest friend Kim Jong IL of North Korea. Undoubtedly, this situation has been an acid test for the re-elected President. Consequently, he has recognised the best side of the media and has started a long tirade against critics through the Financial Times. But I wonder!!!!! Why a media predator, be allowed a free ride in media industry? Finally, dear leaders, we have to work together to weave the threads that will see us celebrating a nation which is not ethnically, regionally divided, a nation that is dedicated to pushing back the frontiers of poverty for all of us. A nation whereby the sun shines for everybody. Otherwise a nation whereby a single clique holds the total economy of the country may lead us to believe that a tsunami of whatever sort is nearby. Allow me to congratulate you ALL (especially the Africa Faith and Justice Network, Friends of the Congo, Human Right Watch, and all of you) who played unparalleled role during this time of need!!!!! Mr. Karekezi Eduard can be reached via Email at "karekezieduard@yahoo.com".